According to the Theater Historical Society of America, Chopin Theatre opened March 1918 and was designed by architects Worthmann & Steinbach. The nickelodeon orginally had 546 seats and was operated by Victor Bardonski. In 1923 it was renamed the Harding and seating capacity was expanded to 987. By 1931 it was called Chopin again but underwent another name change to the Pix Theater. The building is located across the Polish Triangle in the area once named Polish Downtown. In 1955 the building changed to Security Federal Savings & Loan which later moved across the street. When the Dyrkacz Family purchased the building in 1990, it was vacant except for the small 200 sf Eddie's Bistro. The Dyrkacz's have gradually restored the building to its present charm. 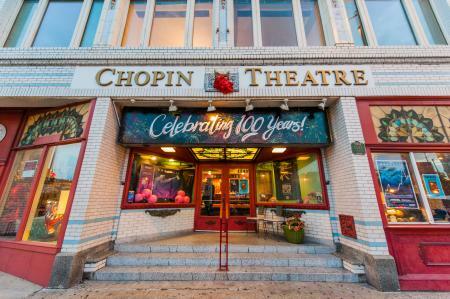 Today, across three stages, Chopin Theatre presents over 500 events annually ranging from theater to jazz and classical music, literature, film and social events. Chopin Theatre has presented over 120 of its own productions, mostly Eastern and Central European. It has hosted performers from each American state and from over 40 countries. It produced I-Fest, an international festival of solo performances bringing 17 international artists from Austria, England, Finland, France, Germany, Lithuania, Poland, Russia, Slovenia, Switzerland and Ukraine to Chicago. The venue has attracted over over 1 million people to its events. Famous Chopin Theatre alum include: Literature - Gwendolyn Brooks, Mircea Cartarsecu, Kevin Coval, Jim Derogatis, Stuart Dybek, Michael Erik Dyson, Nikki Giovanni, Aleksandar Hemon, Malalai Joya, Greg Kot, Yusef Komunyakaa, Li-Young Lee, Philip Levine, Haki Madhubuti, Sara Paretsky, Luis Rodriguez, Charles Simic, Zadie Smith, Studs Terkel, Bronislaw Wildstein, Adam Zagajewski and Howard Zinn; Actors/Directors - Nathan Allen, David Cromer, John Cusack, Jennifer Grace, Sean Graney, Sean Gunn, Witold Izdebski, Steve James, Krzystof Krauze, Steve Pink, Jeremy Piven, Jan Peszek, Patsy Rodenburg, and Pip Utton; Musicians - Edward Auer, Peter Brotzman, Chuck D., Urszula Dudziak, Kurt Elling, Kahil El Zabar, Nils Frahm, Von Freeman, Fareed Haque, Peter Kowald, Adam Makowicz, Rob Mazurek, Dominic Miller, Chad Taylor, Third Coast Percussion, Michal Urbaniak, Ken Vandermark, and Paul Wertico; Visual Artists - Tony Fitzpatrick, Ryszard Horowitz, Tony Karman, Wesley Kimler, Aaron McGruder, Liviu Pasare, Ed Paschke, Art Shay, and Franciszek Starowieyski among many others. Chopin Theatre has also organized over 60 interviews or "Spotkania" with leading Polish and Polish American cultural and political figures including Wesly Adamczyk, Grazyna Auguscik, Andrzej Dudzinski, Jan Englert, Slawomir Fabicki, Feliks Falk, Natasza Goerke, Kazimierz Kalkowski, Tymoteusz Karpowicz, Tadeusz Konwicki, Ryszard Krynicki, Frank Kujawinski, Leszek Madzik, Bronislaw Maj, Michal Pawel Markowski, Andrzej Nowak, Marek Nowakowski, Maciej Plazynski, Piotr Sommer, Andrzej Stasiuk, Grzegorz Stec, Jozef Szajna, Joanna Trzeciak, Beata Tyszkiewicz and Bronislaw Wroclawski. Zygmunt Dyrkacz and Lela Dyrkacz join Justin to discuss the history of the Chopin Theatre and the importance of the theater to the Wicker Park community. 6 Best of the Year Theater Awards 2008 - Chicago Tribune, Chicago Sun Times and TimeOut Chicago (Miss Julie and Our Town by The Hypocrites and Uncle Vanya by Tuta Theatre. Our Town became 1 of 2 plays going on to Broadway in 2008. 2006 Director of the Year Brandon Bruce - Orgie Theater Award for Chopin Theatre’s Production Slawomir Mrozek’s Tango. (Donors Forum is an 1400+ member association of leading philanthropists including MacArthur Foundation, Driehaus Foundation and Ford Foundation. Other honorees: Broadway in Chicago, Blue Man Group and Corbett v Dempsey Gallery).